Successfully Added WiFi Baby Monitor for iPhone/iPad/Android Phone/Tablet - IP Camera, Wireless Camera to your Shopping Cart. 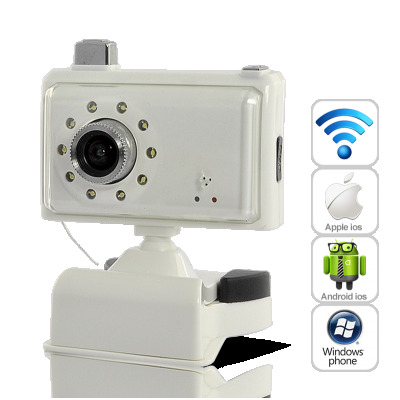 Designed to use with iPhone, iPad, Android Phones and Tablets, this baby monitor/IP Camera is extremely easy to use. No software installation or configuration is needed. Simply turn on the baby monitor, and its IP address will show up in your WiFi connections list. Go to the WiFi setting of your phone or tablet, and connect to the camera. Open the internet browser, enter the IP address as shown in the WiFi connection, and you are set. Everything can be done within just a few seconds. In fact you can use this baby monitor/IP camera with your PC or Laptop too as long as they have WiFi functionality. Clip it to your baby’s cradle and you will be able to see your baby’s every move - even in the darkness, thanks to the nightvision of the camera. Keep an eye on the kids playing in the living room when you are busy in the kitchen, or check out what your secretary is doing when you are in the office. A wide range of applications for this surveillance gadget! This compact and convenient Baby Monitor/IP Camera is now in stock for express shipping worldwide. Order now and we will ship out within a day. Brought to you by the source for latest electronics, Chinavasion.